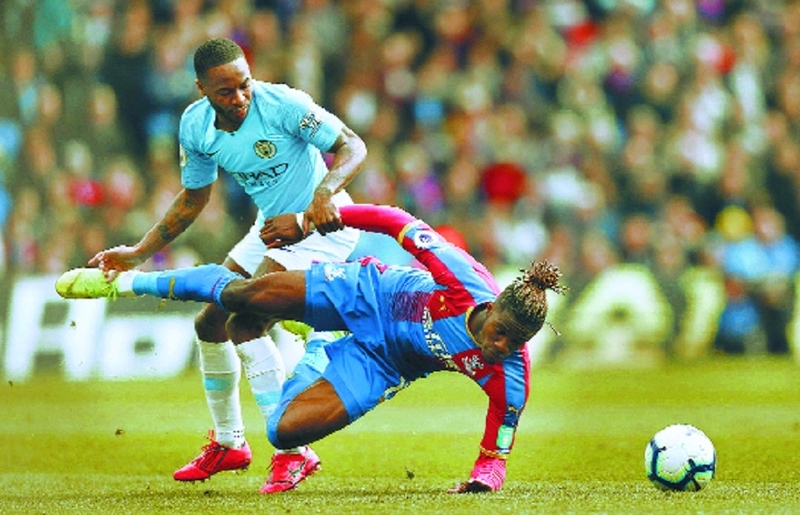 Manchester City forward Raheem Sterling struck twice as the Premier League champions beat Crystal Palace 3-1 at Selhurst Park on Sunday to go top of the table and heap pressure on title rivals Liverpool.Victory left City on 83 points from 33 matches, one point above Liverpool although the Merseyside club can leapfrog Pep Guardiola’s team with a win over third-placed Chelsea later on Sunday. The victory was the ninth straight win for City in the Premier League. Having missed an easy chance early on, Sterling put City ahead in the 15th minute when he ran on to Kevin De Bruyne’s inch-perfect pass from behind the halfway line and fired past goalkeeper Vicente Guaita. The England international added a second for his 17th league goal of the season after the break, meeting Leroy Sane’s first-time cross into the box with a calm left-footed finish that wrong-footed Guaita as it rolled in. Palace ensured an entertaining finish to the contest when Luka Milivojevic scored from a free kick with nine minutes to go after midfielder James McArthur was brought down on the edge of the penalty area. City, however, sealed the deal with their third of the match as De Bruyne latched on to a poor pass from defender Aaron Wan-Bissaka before feeding substitute Gabriel Jesus who finished emphatically. “We controlled the ball really well but one moment in the game and they are back in it. But we responded again and got the third goal,” said Sterling, who added his belief that the title race will go down to the wire. “One hundred percent the way Liverpool have been playing. It will go down to the wire. I don’t see us slowing down now. Liverpool have a great squad, great self-belief, but so do we,” said the former Liverpool forward. Pep Guardiola’s side now face a crucial ten days starting with a home game against Tottenham Hotspur on Wednesday in their Champions League quarter-final second leg, trailing 1-0 from the opening game. City then play Spurs at the Etihad again, in the league, on Saturday before the Manchester derby at Old Trafford on April 24. POGBA TO MAN-U’S RESCUE: Two Paul Pogba penalties earned lethargic Manchester United a 2-1 victory over West Ham United in the Premier League at Old Trafford on Saturday. Having lost five of their previous six matches in all competitions, United certainly looked short on confidence early on against West Ham. who had a goal ruled out in the 10th minute when Felipe Anderson was adjudged to be offside when finding the net. That tight call went United’s way, and soon after they were in front when Pogba hammered home a 19th minute penalty, much to the relief of home crowd.